StudioRAID Thunderbolt 2 is a professional thunderbolt 2 hard drive that packs lightening-fast trasfer speeds with the ultimate flexibility thanks to both Thunderbolt 2 and USB3.0 conntivity. 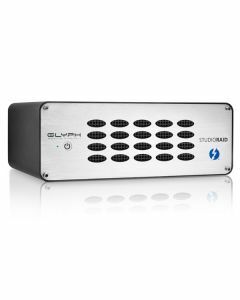 Compatible with both Mac and PC workstations the StudioRAID Thunderbolt 2 supports the most popular RAID modes such as RAID 1, 0, JBOD & SPAN. First Glyph select the highest quality components available. Then they assemble the drives in their US factory, and perform regimented testing on every unit before it ships to you.